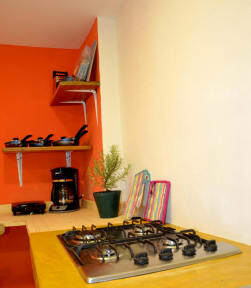 The hostel is situated in a beautiful and quiet neighbourhood. There was a really nice easter market over the Easter weekend, when we were staying. Unfortunately, the windows of our room opened to a sort of air shaft, that ended in the kitchen. So it was hard to get some fresh air, the smells of the kitchen were strong and it was quite loud, if someone was speaking down there. But the hostel was clean, it's easy to get to La Candelaria etc by bus, and the neighbourhood is safe. Nice terrace. Comfy Beds & power sockets next to each bed (huge plus). There was hardly no atmosphere (which was okay, as I chose a quit hostel to recover) at the hostel. Breakfast is nice! 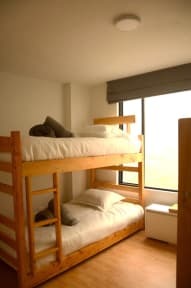 If you're looking to connect with people, I'd recommend a hostel nearby Candelaria or Chapinero (best part of town! ).